Kaito wants a treat, in exchange for walking. 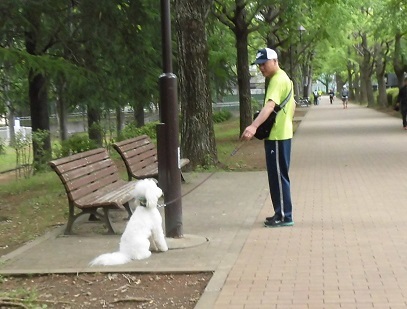 Kaito hopes Taiga might manage to extract a treat from Dad. I said 'no' to a treat, and Dad only stroked Taiga. Anna wants to play with Taiga, but too excited. She just runs about, not knowing how to play. As Taiga turned away towards 2 Shibas, Anna got to check Taiga's smell. 'Mell' (2 years old female, on the left). The male is friendly, but the female is tense and jealous. and the whole 'Shiba scream' starts. So, I let the female smell my hand, and they calmed down. Suddenly, their attention is diverted. Kai, 1 year old, male Border Collie, is waiting to be noticed. The 2 Shibas aggressively check Kai's scent. Kai is an extremely timid Border Collie. Angie, female Japanese Spitz arrives. Angie is jealous but puts up with Taiga snuggleing up to her Dad. But Angie had no reason to tolerate this youngster coming up to sniff her. She leaves Kai in no doubt how she feels. since he plays with her every night in the dog park. as if he were the dominant of the two. It does not stop Kai from trying again.